We recommend checking out our discussion threads on the Samsung 600 TVL Day/Night Bullet Camera with 2.8 to SCO-2080, which address similar problems with connecting and setting up Wired Analog & HD Cameras Samsung. The user manual for the Samsung 600 TVL Day/Night Bullet Camera with 2.8 to SCO-2080 provides necessary instructions for the proper use of the product Surveillance - Surveillance Video - Wired Analog & HD Cameras. 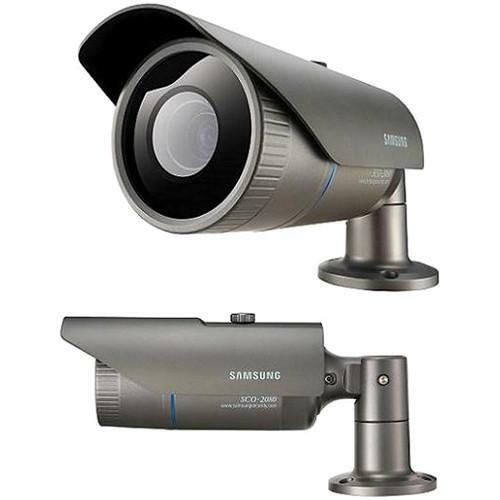 The Samsung 600 TVL Day/Night Bullet Camera, with 1/3" Super HAD color CCD image sensor and a built-in 3.6x varifocal auto-iris lens, offers a resolution of up to 600 TVL. With 2D/3D filtering noise reduction technology (SSNRIII), the camera offers color images in dimly-lit areas with reduced noise in the picture, thereby saving storage space. Using SSDR (Samsung Super Dynamic Range), the camera balances the overall brightness by illuminating the darker areas to the same ratio as the bright areas and produce clear images under high-contrast lighting conditions. The high-resolution camera with Day/Night infrared cut filter removal function switches between color and B&W as per changes in ambient lighting, ensuring accurate color reproduction in daylight and enhanced B&W images at night. HLC (Highlight Compensation) is a feature contained within W-V DSP chipsets which detects bright highlights and masks them out in order to reveal detailed imagery. Gain control allows you to adjust the signal strength to maintain a constant brightness level. The SCO-2080 high-resolution camera offers auto white balance to adjust for color temperature range of 1,700-11,000°K to get the most natural colors. Using DIS (Digital Image Stabilization), the SCO-2080 camera offers steady pictures by compensating for any camera movement caused by external stimuli. The advanced motion detection feature detects motion without any additional external sensor. Privacy masking allows you to mask up to 12 user-programmable zones of a scene for privacy reasons. Camera control using the video coaxial cable allows to remotely set up the camera, thus offering ease of installation and remote adjustment in real time. The multi-language OSD offers intuitive and convenient interface for easy operation. Housed in a weather-resistant enclosure, the camera is protected against water and dust, and the included sunshield protects the unit from direct sunlight. If you own a Samsung wired analog & hd cameras and have a user manual in electronic form, you can upload it to this website using the link on the right side of the screen. Power Consumption 3.8 W max. Box Dimensions (LxWxH) 11.5 x 10.3 x 5.1"
The user manual for the Samsung 600 TVL Day/Night Bullet Camera with 2.8 to SCO-2080 can be downloaded in .pdf format if it did not come with your new wired analog & hd cameras, although the seller is required to supply one. It is also quite common that customers throw out the user manual with the box, or put the CD away somewhere and then can’t find it. That’s why we and other Samsung users keep a unique electronic library for Samsung wired analog & hd camerass, where you can use our link to download the user manual for the Samsung 600 TVL Day/Night Bullet Camera with 2.8 to SCO-2080. The user manual lists all of the functions of the Samsung 600 TVL Day/Night Bullet Camera with 2.8 to SCO-2080, all the basic and advanced features and tells you how to use the wired analog & hd cameras. The manual also provides troubleshooting for common problems. Even greater detail is provided by the service manual, which is not typically shipped with the product, but which can often be downloaded from Samsung service. If you want to help expand our database, you can upload a link to this website to download a user manual or service manual, ideally in .pdf format. These pages are created by you – users of the Samsung 600 TVL Day/Night Bullet Camera with 2.8 to SCO-2080. User manuals are also available on the Samsung website under Surveillance - Surveillance Video - Wired Analog & HD Cameras.